Spring has sprung, and it’s time to begin planning my garden! Gardening has many health benefits, and researchers say that simply viewing a garden can provide psychological benefits. I enjoy it because it gives me an opportunity to use my creativity in researching and planning my garden. Each year my small urban balcony is transformed into an edible landscape that provides fresh herbs and vegetables. I love that both gardens, big and small, can provide good nutrition at your fingertips and give you control over what pesticides and fertilizers are used — if any. Gardening can also be a great way to make eating a family affair by inviting children into the process. Children are more likely to eat and enjoy fresh produce if they are involved in the growing process. This year I am planning on growing more fresh herbs such as basil, oregano, parsley, rosemary for salt-free flavor and mint and chamomile for tea! I also am planning on growing bell peppers, tomatoes and spinach in my small flower boxes. I must say that herbs are a great place to start for beginners. 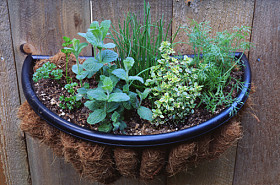 Herb gardens can be started from seeds or plants. Seeds germinate quickly, within one week, for the impatient gardener. If you are starting an herb garden from seeds, be sure to plant seeds 2 to 4 inches apart and no more than ¼-inch deep. Since herb seeds are tiny, you can mix the seeds with a bit of sand to make them easier to sow. After planting, mist the soil and cover the soil or containers with plastic wrap until they germinate. This will be sure to keep the seeds moist. If you are starting your garden from young plants, be sure to plant them at least 4 inches apart to provide room for growth. You can learn more at HerbGardening.com. I encourage you to dig in and consider gardening this year! Cassie Vanderwall, MS, RD, LDN, CPT, is an outpatient dietitian who works in the Nutrition and Wellness Center at Rush University Medical Center. This entry was posted in Food and Nutrition and tagged container gardening, gardening, herbs. Bookmark the permalink. I love planting edible flowers such as pansies which I then sugar and use for decoration on cakes, etc. That’s what you called “Healthy landscaping”. Not just an ordinary garden.